MONTREAL - Consumers won't know if any foreign carriers will bring more competition to Canada's cellphone market until next week. However, big domestic carrier Telus confirmed that it has put down a refundable deposit to meet Tuesday's deadline to bid on radio waves needed to operate cellphone networks. Wind Mobile has already said it will be among bidders for the Jan. 14 auction. Canaccord Genuity analyst Dvai Ghose said that since the initial deposit required is "small and refundable" — $16 million — there may be foreign carriers on the list, such as major American carrier AT&T. "The inclusion of foreign carriers on the list could drive Rogers, Telus and BCE share prices lower," he said in a research note. 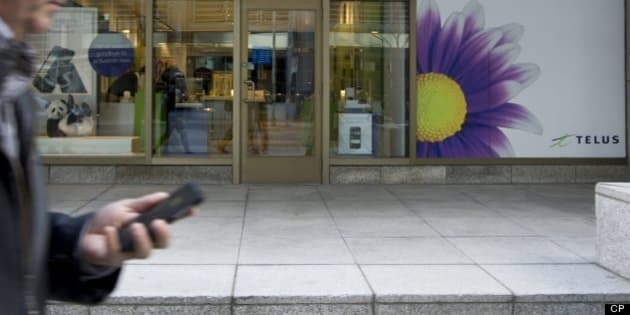 Rogers (TSX:RCI.B), Telus (TSX:T) and Bell (TSX:BCE) say they took a collective hit of almost $15 billion on the capital markets when the news broke in recent months that Verizon was considering entering Canada's wireless market. "However, putting one's name in the hat is very different from actually becoming a wireless new entrant," Ghose said. Ghose noted that putting down a deposit "does not cost much," but the price tag for a new player coming into Canada and getting launched could be more than $3 billion. Industry Canada will release a list next Monday of those who applied to participate in the auction and wouldn't say Tuesday how many deposits it had received. U.S. carrier AT&T wouldn't confirm if it would take part in the auction after Verizon announced it was no longer interested in competing in Canada's wireless market. Rogers declined to confirm its participation, but is expected to be a bidder. Bell CEO George Cope recently said that Bell intended to take part in the auction. Financially struggling Mobilicity wouldn't say if it's participating and new player Public Mobile also declined to comment. The auction of 700 megahertz spectrum, which analysts have called "
"beachfront property" due to its value, could raise a lot of cash for the federal government. The 2008 auction raised about $4.3 billion. Canada's big three carriers have about 25 million customers between them and dominate the market, making it difficult for new players of any size to attract customers.